11th July 2018, London: Acamar Films and Minor Entertainment have announced that, due to popular demand Bing Live will be extending their first ever UK stage show tour into 2019! 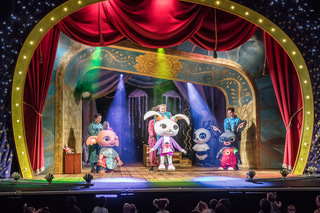 Bing Live, a brand-new stage production full of laughter, music and dance, sees Bing, Sula, Pando, Coco, Amma and Flop, brought to life, by internationally acclaimed Puppet-designer Tahra Zafar, to discover the true magic of theatre for this first time. Bing Live will now play an additional 20 venues from 5th January 2019 until 28th April 2019. These newly announced dates, strengthen the existing sell-out performances across 40 venues already confirmed throughout 2018. Bing Live premiered on 24th June 2018 at the Alban Arena in St. Albans with a Gala Performance attended by 850 people, with 250 staying for the after-show party. 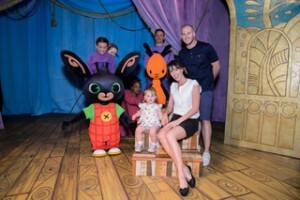 A number of celebrity parents brought their Bingsters along, including; writer and producer Charlie Brooker and actress and writer Konnie Huq, Katherine Kelly (Coronation Street), Dani Harmer (Tracy Beaker), JB Gill (JLS, Down on the Farm), Verity Rushworth (Emmerdale), comedian Richard Herring and the British former World Cup alpine ski racer Chemmy Alcott. Pre-schoolers and grown-ups were thoroughly entertained by Bing, Sula, Coco and Pando as they learnt how to tell stories in the theatre by pretending, dressing-up, dancing, and singing songs. After the show lucky Bingsters and their parents enjoyed face-painting, balloon artists and afternoon tea in the foyer. 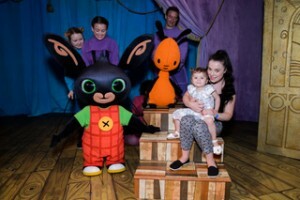 Bing Live is the perfect first theatre trip for pre-schoolers and their families. Going to the theatre… it’s now a Bing thing! Bing Live is produced by Minor Entertainment (In the Night Garden Live) and directed by Will Tuckett, guest principal character artist of the Royal Ballet, whose production of Wind in the Willows won an Olivier Award for Best Entertainment in 2014. The show brings together a first-class creative team. Bing Live is adapted for the stage by Helen Eastman with costumes and puppet design by award-winnning Tahra Zafar. As Head of Costume, Hair and Make-up for the Olympic and Paralympic Opening and Closing Ceremonies staged in London, 2012, Tahra managed the production of 23,000 costumes for all four Ceremonies. Her film projects include: Star Wars VII The Force Awakens, X Men-First Class, Harry Potter and the Philosopher’s Stone and The Fifth Element and for television: In the Night Garden, Zingzillas and The Adventures of Abney and Teal. The show has music by Alex Silverman, sound by Rich Walsh and set design by Samuel Wyer. The cast of Bing Live are Mia Jerome, Michael Magennis, Hayley Murray, Will Palmer, Alice De Warrenne and Nia Walsh. Minor Entertainment was founded to create spectacular live family entertainment. Its first production, In the Night Garden Live, broke the mould for pre-school theatre and has sold over one million tickets to date. Minor’s Creative Director, Andrew Collier, has over 20 years’ experience, and has been involved in bringing shows including Fimbles, LazyTown, SpongeBob SquarePants, Peppa Pig and In the Night Garden to the stage.